A delightful and useful book this - having just done a whistle stop tour of the Tyne and come to the conclusion that I have barely scratched the surface of what the north east has to offer, along comes a guide which is fun to read and describes the fishing as it is, without the gloss that spoils so many works of this type. Pete starts with a short history of trout fishing in the region, which was the first time I had realised how much the river systems had been changed by the last ice age (I was only a bairn then and Jon can only remember it dimly), before moving on to walk-throughs of the Coquet, the Wansbeck, the Wear and the Derwent. When I say a walk-through, that is exactly what you get; a trout fisherman’s account of each river, section by section, pool by pool, right down to where to park, whose permit to get and which bus to catch. As if that wasn’t enough, Pete even gives phone numbers and web site addresses - sure, this information ages, but hey, we are talking about the God’s country here and most of the clubs he lists have been around since the ice retreated and are in robust good health. Even the private stretches have mostly been in the same hands since I can recall. Beginners will love this book because there is enough information to get you into the all right places using the correct method, but the author doesn’t spoon-feed the reader and experienced visitors to the region will gain just as much. The next couple of chapters repeat the template for salmon fishing, although the descriptions of the fishing itself are much briefer and are chiefly confined to the Tyne and the Tweed catchment; Pete does, however, cover the ground reasonably well, once again giving contact details and instructions on where to park, before he moves on to repeat the process for reservoir trout fishing. Up until now, the talk has been more or less entirely about salmonids in Durham and Northumberland, although a high proportion of the fisheries described above allow both fly and bait, but in chapter seven and eight, the author turns to coarse fishing, which lives something of a Cinderella existence in the north, in part thanks to a lingering perception that coarse fish are vermin. It will come as news to many that the Wear has an introduced population of barbel and dace, but the Wear is the northerly limit for many coarse species and so now Pete turns his attention south for the first time, to North Yorkshire and the Ouse catchment, which has tended to lead the way as far as coarse fishing in the north east is concerned. Of course, there are coarse fisheries further north, starting with Bolam lake near Morpeth, which is rightfully described as the great perch and pike fishery it is, but Pete concentrates on the fisheries he knows best, including Brasside lake in Durham and the river Wear and the Swale, both of which hold large heads of coarse fish in their lower reaches. Then, after a brief chapter on sea fishing opportunities, the author moves on to a discussion of the best methods - both fly and coarse - before rounding off with a summary of venues and contacts. 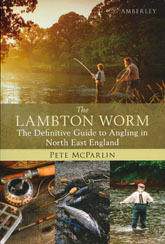 The Lambton Worm isn’t comprehensive and it could do with an index, but it has great charm and, when it boils down to it, it is the only game in town, because there aren’t any other comparable guides to angling in the north east. I live up here and I learned from it, so if you are planning a visit, or like me, you are lazy sod who isn’t making the most of the opportunities on his own doorstep, I suggest you get right out and buy a copy now.